Boy howdy, the folks at Spike Chunsoft don't hang around. 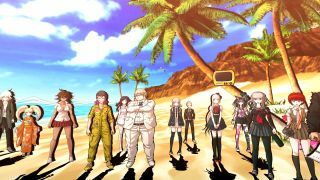 Danganronpa: Trigger Happy Havoc only appeared on PC last month (despite having been on PS Vita since 2010), and Danganronpa 2: Goodbye Despair is already winging its way towards us. It's pegged to appear on Steam April 18, priced $30—an encouraging sign that the first sold well enough to tempt a Japanese developer further into the verdant fields of PC gaming. After the horrific events of the first game, you and your classmates find yourselves on the deserted Jabberwock Island to collect Hope Shards and befriend each other. Aww. Unfortunately, the murderous teddy bear of the first game just happens to arrive on Jabberwock to sun himself, and the tyke just can't resist some mind games. If this is all gibberish to you, we've put together a helpful piece titled 'What the hell is Danganronpa?' to clear things up (insofar as a game about a psychotic stuffed toy can be cleared up).